Castro Coleman a-k-a Mr. Sipp, “The Mississippi Blues Child” was born August 25, 1976 to Johnelle and the late Vera Coleman in the small town of McComb, MS. He began playing the guitar at the tender age of 6. 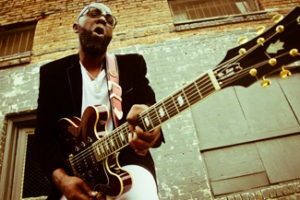 Through hard work and perseverance, Mr. Sipp has become a Delta Blues Force to be reckoned with! Being recognized for his amazing vocals, songwriting ability, musicianship, ability to produce records and entertain Fans with an upbeat, outlandish show all make Mr. Sipp “The Total Package.” Above all of that, Mr. Sipp is a God fearing family man. With over 125 recording credits to his name, Mr. Sipp has played on over 50 national recordings with several Grammy nominated projects. He is well traveled and ready to come to play for you and spread his great gift of music to the World. Mr. Sipp spent 22 years in the Gospel Music Business as a Recording Artist and a Producer! Since his BIG WIN at The International Blues Challenge in 2014 and the release of his debut Blues CD, “It’s My Guitar,” the music community has been a Buzz and welcomed him with open arms! On his debut, Sipp sings all vocals and plays all instruments for the entire record! That surely made listing the credits easy. Yes sir, when God was handing out musical talent, Mr. Sipp apparently was at the head of the line! What a talent! On his new release, his debut recording for Malaco Records, entitled “The Mississippi Blues Child,” Mr. Sipp once again handles all of the vocals and plays numerous instruments, however this time around he is joined by other reputable Malaco Mississippi “Hitmen.” All songs with the exception of one are originals, and his diverse style of music separates this record from many of the other recent “cookie cutter” Delta Blues recordings. Mr. Sipp is a FORCE to be reckoned with and is proudly endorsed by Ernie Ball Strings and Epiphone Guitars which he plays exclusively.